In November, students at Discovery Charter School, in grades 5-8 participated in the Student Spaceflight Experiments Program (SSEP) competition to send an experiment to the International Space Station. This was no easy task, and yet Discovery had 74 teams enter the competition. The written proposals for the experiments were judged by a panel consisting of teachers, scientists, and engineers, and then the top three proposed experiments were submitted to the SSEP for review. One Discovery experiment was chosen to fly to the International Space Station on June 29, 2018. Currently aboard the international space station is an experiment to determine The Effect of Microgravity on Spider Plant Seed Germination. The experiment was developed by 5 middle school student scientists: Kimberly Wei, Amelia Lipcsei, Grace Farrell, Natessa Wright, and Morgan Lord. Astronauts aboard the ISS are following their instructions to complete the experiment in space. All three of the Discovery teams were invited to present their experiments at the Smithsonian National Air and Space Museum in Washington D.C. Besides the Spider plant experiment, two other finalist experiments were represented. These included The Effect of Microgravity on Artemia Cysts by Maleah Frances and Shiori Kawaguchi and Lactobacillus Casei in Microgravity by Zoe Fotakis, Adela Simka, and Chien-Yu Sun. In order to simulate a professional science conference, each team was kept to a strict 6 minute audio-visual presentation with 4 minutes of time allotted for questions by other teams as well as the general public. Including the student scientists, San Jose was represented by 39 family members, friends, and teachers. The public was also given the opportunity to interact with all the teams during an hour long session where teams shared a summarized, tri-fold presentation of their experiment. The Student Spaceflight Experiment Program provided keynote speakers from the fields of Astrophysics and The Center for the Advancement of Science in Space. Students were given time to explore the museum before the general public arrived and were given the opportunity to experience IMAX in 3-D. The experiment/mini lab will return to earth around July 30, 2018. The Spider plant experiment will be overnighted to San Jose where the team will meet to compare and analyze the results with their ground truth experiment. The project is part of the Student Spaceflight Experiments Program (SEEP), offered by the U.S. National Center for Earth and Science Education and the Arthur C. Clarke Institute for Space Education to inspire a new generation of scientists and engineers. The Discovery School (Phoenix campus) is located in west San Jose, CA. 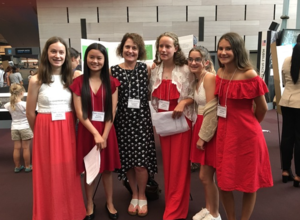 From left to right: Grace Farrell, Kimberly Wei, Susan Leftwich, Natessa Wright, Morgan Lord, Amelia Lipcsei.